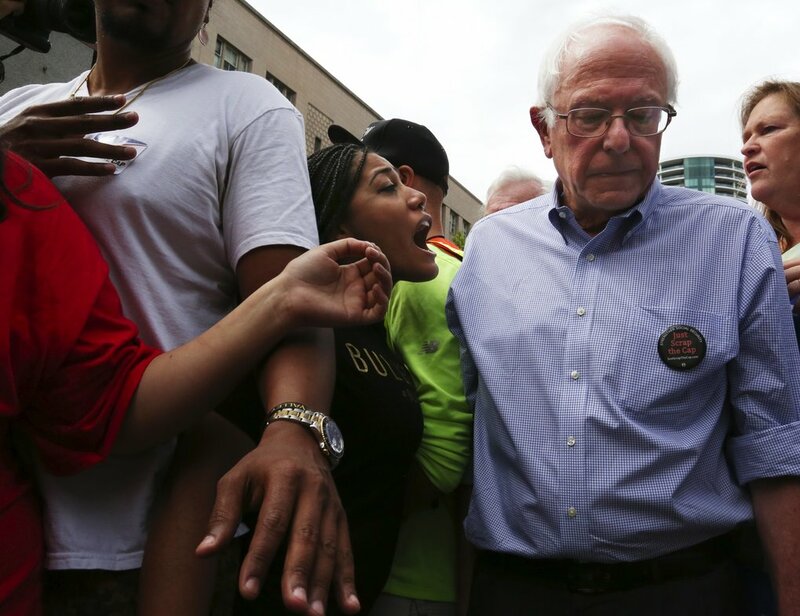 Bernie Sanders ended his presidential campaign Tuesday, not with a bang but a whimper. The Vermont senator formally endorsed his rival in an undignified prostration before the Democratic Party establishment and Wall Street’s favored presidential candidate, former Secretary of State Hillary Clinton. The unity rally featuring Sanders and Clinton in Portsmouth, New Hampshire, had all the spontaneity and enthusiasm of a going-out-of-business sale. The funereal atmosphere was perhaps fitting, because with the demise of the Sanders campaign, the Democratic Party has demonstrated, for the thousandth time, its historical role as the graveyard of progressive movements and efforts to achieve reform through the capitalist two-party system. The mass support for a self-proclaimed socialist shocked the US ruling elite, the Democratic Party establishment, and, no doubt, Sanders himself. It demonstrated that, despite decades of incessant media propaganda against socialism and communism, the experiences of masses of working people and youth are driving them to the left. This was particularly true among the younger generation. Sanders won by huge margins—70, 80, even 90 percent—among primary and caucus voters under 30 years of age. More than 1.5 million people attended his rallies, with college students and youth of college age predominating. The Sanders campaign did not create the broad radicalization demonstrated in these figures. The Vermont senator’s bid for the Democratic Party nomination rather served to uncover what was already developing, the product of decades of deepening economic inequality, ceaseless war, attacks on democratic rights and the growing realization that the profit system is leading mankind toward catastrophe. Once the Democratic primary campaign was fully engaged, however, Sanders’ political task—in the eyes of the US ruling elite—became clear. It was his responsibility to put the genie back into the bottle. He had to deliver his millions of supporters, particularly the youth, to the candidate chosen by the Democratic Party establishment. In the beginning was the end. From the start of his campaign, Sanders understood the role assigned to him. He abandoned his longstanding pretense to being a political “independent,” and pledged to remain within the framework of the Democratic Party regardless of the outcome of the contest for the nomination. Throughout the Sanders campaign, the Socialist Equality Party has welcomed the broad shift to the left that it revealed in the thinking of millions of working people and youth, while warning that the Vermont senator would inevitably disappoint his supporters. We drew attention to two key aspects of the Sanders campaign: his silence on foreign policy and the growing danger of war, and his refusal to criticize the Obama administration for bailing out Wall Street and spearheading the corporate attack on the jobs and living standards of working people, beginning with the 50 percent wage cut imposed on new hires in the auto industry at the insistence of the White House. Tuesday’s “unity” rally with Hillary Clinton demonstrated both these tendencies. Sanders spoke for 30 minutes without ever mentioning foreign policy, only days after Obama announced an extension of the US military intervention in Afghanistan and approved the dispatch of another 560 US troops to Iraq. In his tribute to Clinton, Sanders never referred to her four-year tenure as secretary of state, where she was consistently the most hawkish member of the Obama cabinet, instigating the US-NATO war with Libya and advocating even greater US intervention in the Syrian civil war. As for the Democratic Party’s domestic record, Sanders praised Obama’s actions during the 2008-2009 Wall Street crash. “I thank President Obama and Vice President Biden for their leadership in pulling us out of that terrible recession,” he said, although Obama and Biden saved the bankers and billionaires at the expense of the working class. Clinton’s own remarks at the rally were equally demagogic and deceptive. She denounced “trickle-down supply-side economics” which were responsible for “30 years of a disastrous Republican philosophy that gave the huge breaks to those at the top.” She conveniently left out that those “30 years” included the eight-year administration of her own husband, who followed the dictates of the financial markets no less slavishly than the Republicans. She pledged to “open the doors to everyone who shares our progressive values,” although the political careers of both Bill and Hillary Clinton have been based on moving the Democratic Party ever further to the right—abolishing welfare, promoting harsh policing and mass imprisonment, deregulating the banks, and generally distancing the Democrats from any association with policies of liberal reform. In his remarks Tuesday in New Hampshire, Sanders declared that his campaign would continue, in the form of an all-out effort to elect Hillary Clinton president and elect Democratic majorities in the Senate and House of Representatives. To call such an outcome a “political revolution” is, to say the least, a cynical fraud. The Democratic Party is, like the Republican Party, an instrument of the financial aristocracy that rules America. While the Republican Party generally expresses the ruling class’s appetite for wealth and power in its most unrestrained form, the Democratic Party has long served as the principal vehicle for neutralizing any challenge to the corporate elite from below. Despite the best efforts of the media, the Democratic Party and the political establishment as a whole, including Sanders himself, the social and economic opposition that found an initial expression in support for his campaign will not disappear. Whoever wins in November will oversee a society riven by social conflict and will implement deeply unpopular policies, including a sharp expansion of war abroad and the attack on the working class at home. Workers and young people attracted to the Sanders campaign must draw the necessary conclusions. The Democratic Party cannot be transformed and capitalism cannot be reformed. A leadership must be built to unite the developing struggles of the working class in a revolutionary movement against the corporate and financial elite and the profit system they defend. Sanders supporters in 2016, like Nader supporters in 2000, conflate integrity with intelligence. If they help defeat Hillary, as Nader supporters did Gore, then white nationalism wins the White House. Sanders supporters should continue to fight for a social welfare state, but helping put Trump in office won’t accomplish that. Learning from the past, they should vote Hillary, then fight her administration, and continue taking over the Democratic Party, building on the foundation of the Sanders campaign. Sanders supporters accomplished a lot, and they would be remiss to throw it all away. If they set their sights on securing their Democratic Party position at the local and state level, they will acquire greater influence at the national level. Real commitment to implementing social values requires thinking long term. In 1989, UC Berkeley published Jerome Himmelstein’s study To the Right about the transformation of American conservatism in the Reagan years (1980s), that led to the present influence of Christian white nationalism in the GOP. In a nutshell, they began building a grassroots movement by taking over local school boards, then local governments, and eventually state governments. Now, they are influential in both Congress and the RNC. It didn’t happen overnight. Sanders became a traitor to the people and a minion to the establishment the day he he chose to run as a democrat, rather than an independent. At that time he, like the rest of us could never have predicted Trumps success, so to say he’s backing Clinton to keep Trump out (when he said he’d do this from the beginning), is a lie. While campaigning he vehemently spoke against the corruption that is Hilary’s history, and now says she’s the most qualified person for the task . . . qualified for what? . . . to continue the fall down the rabbit hole that the US and the world are experiencing? I’m a Canadian who was in love with his message and hope, but am now disgusted with his shameful fall from grace.